Our System acquires several different sensor inputs, FM modulates each level by manipulating Direct Digital Synthesis increment values, transmits the resulting signal on a commercial FM radio band, and receives and decodes the original sensor levels. The problem of encoding multiple input signals into a finite bandwidth space is one that is common in engineering problems today. It is found in communication system encoding schemes from cell phones to cable TV. The problem is that the system needs to carry several independent signals over a single communications medium. Some examples of data encoding for these data communication problems include time division multiplexing (i.e. telephone lines), code division multiplexing (cell phones), statistical multiplexing (internet), and frequency division multiplexing (cable TV). We have designed a wireless telemetry system that utilizes frequency division multiplexing (FDM) to encode several input sensor values onto a single analog channel for transmission. By using a single transmitter, we can simplify design and reduce bandwidth consumption and power costs. We have encoded three-axis accelerometer data using our technique. Direct digital synthesis (DDS) was utilized to convert three separate ten bit number intro three orthogonal frequencies. A linear combination of these orthogonal signals was FM modulated into the commercial FM band. We also have developed a decoding scheme which reconstructs the original input levels. Our original design centered on developing a telemetry system for an instrumented Frisbee. We choose to explore this project due to our mutual interest in the games of ultimate Frisbee. We ran intro several problems completing our ultimate goal. However, we achieved the core functionality of our system. Specifically, we were able to encode, transmit, receive, and decode the acceleration sensor values. We utilized FDM encoding due to our experience with DDS in lab two and our limitation of a single transmitter for our system. Our signal consisted of a double FM process. One Frequency Modulation step was used to put the accelerometer A/D values into the same signal using Frequency Division Multiplexing. Each A/D value was used to increment a direct digital synthesis sine wave and 3 sine waves of varrying frequency were summed and output to the tuning pin of a voltage controlled oscillator (MAX2606) within the commercial FM band (88-108MHz). We Chose to encode our signals using frequency division multiplexing due to the orthogonality of frequency components and the fact that we were limited to a single transmitter onboard our system. This allowed us to encode all 3 signals onto one channel. We used our experience with direct digital synthesis from lab 2 to generate our sine waves with frequencies varrying in 3 different bands. We decided that we wanted to use a commercially available FM demodulator (i.e. a walkman) to demodulate the wireless signal, so we knew we'd be limited to the range of human hearing for frequency encoding. We chose to fit our 3 accelerometer values into a 10kHz range. Each accelerometer analog level would be converted into a 10-bit number on the A/D port of the Atmel. Three 10 bit numbers means we needed 3*2^10 or 3072 unique frequency values. The resolution of the DDS increment is Fs/2^x where x is the width of your accumulator and Fs is the sample rate of your output signal. In order to factor in guard bands between signals and to provide an even division of our MCU clock frequency (8MHz), we chose a sample rate of 160kHz and an accumulator width of 16-bits. This accumulator has a resolution of 2.44Hz per level. One level corresponds to 3.2mV and this corresponds to 0.025 g on the accelerometer. For each period of the DDS, each sine level was looked up from the 8-bit table for the three different accumulators. These three values were added together and output on port pins into an Analog Devices 5340 Digital to Analog Converter to create the FM and Frequency division multiplexed single channel signal. A commercially available FM radio tuned to the previously unoccupied segment of the 88-108MHz band where our transmitter resided. 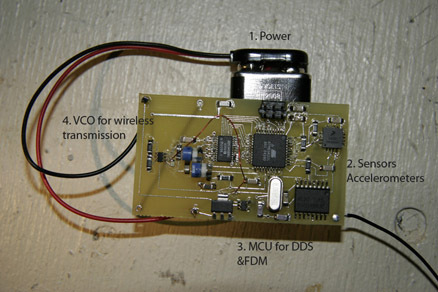 The audio output of the radio was directly connected to the mic port on a laptop and the RF-demodulated signal was acquired using the data acquisition toolbox in MATLAB. Once acquired, the data was band pass filtered using 3 separate 7th order butterworth filters. The butterworth filter bands were designed around our calculated values for frequency levels with some buffer outside of the band due to the steep edgets of the 7th order filter. The resulting three waveforms were the three pure FM tones encoding our acceleration levels. These three single channel FM signals were passed into the fmdemod function in the MATLAB communications toolbox. The signal output was a level corresponding to the frequency of the signal at any point in time. From here, the 3-D acceleration value had been decoded and ANY kinetic metric could be calculated. All hardware components and software tools were available either as samples or at an affordable price for the project as it was conceived. The proposal called for wireless transmission that could be demodulated using a commercial FM radio. We didn't have enough bandwidth in that case to transmit a digital signal. We created our own encoding scheme for our data based on our understanding of direct digital synthesis and frequency division multiplexing. IEEE/ISO/ANSI standards do not apply. From top to bottom, our system is an original idea acquiring original data. It was not modeled after any other system in existance. Our system was concieved from a common interrest in frisbee and a knowledge of analog sensors, microcontroller processing, Newtonian Mechanics, and communication systems engineering. Our program structure consists of an initialization phase written in C followed by a carefully contstructed loop written in assmebly code. This loop is a multi-path function which handles the direct digital synthesis and the analog sampling. Through any given conditional path of this looping function, the program must execute exactly 50 clock cycles in order to maintain the 160kHz sample rate. The main challenge in the code was manually tracking each branch and making sure that it was padded with enough clock cycles to meet the target sample rate. Our Matlab code carries out three main functions. Conversion of the FMDEMOD output to an actual acceleration level derived from the accelerometer datasheet. Power consumption was on the order of 15mA. The system could not be driven by lithium coin batteries (rated at 0.2mA). We could not find a low G z-axis accelerometer that worked at 3.3V, so we had to power it with 5V and reduce the range of recordable accelerations in one direction. Beat frequencies between signals created a nonlinear noise source in our signal. It was mostly removed by filters, but was still present in the final calculated values. The only C code involved was for initialization of the sine table and the chip itself. After initialization the program enters a conditionally branching loop coded entirely in assembly which carries out the 3 channel direct digital synthesis and the A/D conversions. The Assembly loop has exactly 50 clock cycles independant of the conditional path taken through it. This preserves the 160kHz sample rate for the DDS at all times. Though our code was not able to take advantage of the full resolution of the A/D on the Atmel, our demodulation scheme returned values corresponding to gravity in all three directions independantly. There were some nonlinear interractions between our three signals (beat frequencies) that we were unable to extract and which caused noise in our decoding algorithm. The frequencies generated fell within exactly the specified ranges in the DDS code and our acurracy was limited to 100 miligravities (4 times the A/D resolution). The system was independantly powered with a low voltage source. The transmitter was low power and coupled poorly through a makeshift antennea. The system is self contained and there are no safety concerns. The interface is simple. The user tunes the device to an empty FM channel using 2 potentiometers on the board itself. 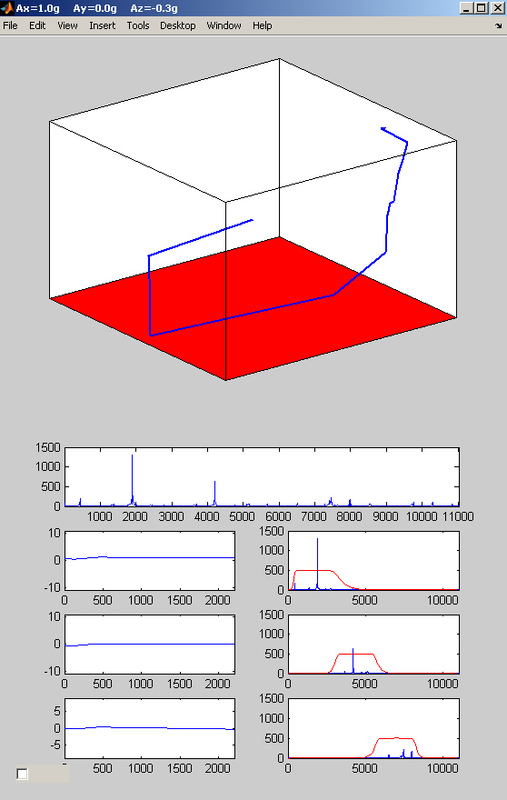 The user then connects an FM radio to the mic port of a laptop computer running Matlab (with the data acquisition toolbox) and the matlab code gives a visual representation of the directional gravitational force applied to the object. The PCB CAD file: 476final.pcb (you must visit ExpressPCB.com for the CAD program). The system is robust and capable of being applied to any voltage level producing sensor value. It's small and easily contained for transport and with proper antennea coupling, it could have a considerable range. The software interface is easily modified for any sensor application. Section 15.239 Operation in the band 88 - 108 MHz. kHz band shall not exceed the general radiated emission limits in Section 15.209. (4) A statement that the device complies with the technical provisions of this Part. Part (a) is met by tuning of one of the potentiometers on the board itself. In accordance to FCC regulations, we would send a letter to the Engineer In Charge of the local FCC office if we wished to use our device for an extended period of time with a well coupled antennea. But due to poor radiation from a makeshift antennea, the device most likely falls below the requirements for part (b) of section 15.239. In most orientations of the antennea, the signal can not be detected at 2 feet, let alone 3 meters. Our project was specified to track kinetics of the flight of an instrumented frisbee. We accomplished all of our goals save the actual application of the device to a frisbee itself. Our design process moved fluidly throughout the month of work on the project. Build a printed circuit board, order parts, sample parts. Though we didn't reach the particular application we specified (instrumented frisbee), all of the engineering subsytems for encoding, transmitting, receiving, and decoding are in place and working smoothly. The following are the intellectual property and copywrite of Gus Lott (GKL6@cornell.edu). His consent must be given before duplicating any of the contents of this project, including this report, for anything other than educational purposes. This project is of limited scope and application. As such, it is not intended for dissemination into the public for use. The project members are not bound by the IEEE code of ethics. However, some of the IEEE code of ethics contents have been met in this project. Claims in this report are based on available data only and our comments are honest and appropriate references are sited. This report helps to improve the understanding of the relevant technologies involved. This project has advanced the technical competance of the members of the project. No one was discriminated against in the creation of our system. Injuries were avoided. The following files are examples of what the output sounds like when the system is accelerated in each direction. Each of these audio files were created while oscillating the board back and forth in my hand.